To dig deeper in the themes of our Fall/Winter 2017 collection, we collaborated with three young filmmakers: Mati Diop, Baptist Penetticobra and Eduardo Williams who express a singular relationship with the world through their work. Mixed, expatriated, nomads, their intimate vision of the world is expressed through juxtapositions of fictional and documentary places, of hybrid, incompatible or symbiotic bodies. Journeys are made bicycling through big cities, in pop-culture heavy monologues or through various countries that form an alternate dimension. Bolivia, France, United States or Argentina — countries of origin, adopted or simply of passage — are embodied in colors, accents and physical movements. Full moon above the city of Paris. A young man crosses the city neighborhoods on his bike, when elsewhere a group of distinguished young people that seem to come from another planet, stroll, smoke and chat. The bluish lights of phones illuminate faces, the face of the young man with the bike contrasts with the dark blue sky which is not yet night sky. The title of the film, Olympus, draws its inspiration from the name of a popular area in Paris, Les Olympiades. 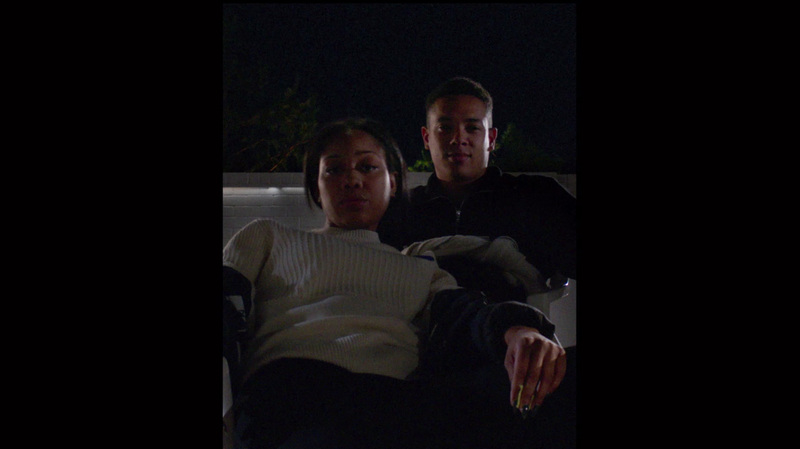 French director Mati Diop captures this parisian night through the eyes and movements of her brother, the model Gard Diop. A dreamy trap score soundtracks Olympe and turns an ordinary night into a moment suspended in time. This is the first film you shot for a brand, did you approach this project differently? I approach each of my films differently. Intimate and narrative stakes, conditions of production are never similar. But it’s true that a commissioned film or project is something else. I had never been approached by a brand. But when KENZO reached out to me, I didn’t feel like I was solicited by a “brand” but rather by artists who were receptive to my work, who were giving me an opportunity to propose something, to make a film freely within a given context. Moreover, it was a carte blanche where clothes would serve the film and not a commission. Which, in principle, was leaving a lot of freedom for my film. The young man on the bike happens to be your brother, Gard Diop. What made you want to work with him? 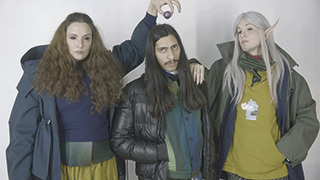 The desire to film Gard was prior to and independent from this KENZO project. Gard have been living in Tokyo where he works as a model for some months. I wanted to make a film with him when he visited Paris this past summer. KENZO’s carte blanche was the dreamed opportunity to realized this. I started from this idea of an imaginary portrait of Gard, made up of fragments of fictional and real snapshots from his life as a young man and model, in the form of a summer crossing through Paris. But a few days into the making of the film, I unfortunately had to give up. I realized the film, with his intimate, fictional and documentary dimension, was becoming too ambitious and wild to fit the framework. How did you meet the band of friends at the center of your film ? In the 13th arrondissement, right after shooting a few takes with Gard. They were sitting over the esplanade of the BNF, talking and listening to music. Right away, I wanted to film them. Not only because they were “young and beautiful”. They are more than that in my eyes. They immediately accepted to be filmed and Gard mingled with the group quite naturally and graciously. That’s how Olympus was born. From this coincidence, this encounter, this mix. Paris is a city that can be viewed as saturated cinematically speaking but there are places like the ones in your films that have yet to be conquered. How did you choose these places ? What bonds do you have with them? I had not shot in Paris since Last Night, my first short film shot in 2004 in Max Dormoy and in the Olympiades neighborhood. At the time, the O. (and its surroundings) was the only places I found “shootable” in Paris. What triggered my desire to film in Paris this summer was less my longing to depict these places in particular than to capture the singular atmosphere a heat wave can produce. There is something of the order of annihilation and disorder that interests me. I found the idea of a blazing wind from Sahel penetrating and colonizing Paris poetic. For that matter, my initial project was named Sirocco. I shot a series of “heat wave” takes with and without Gard, between Château d’Eau and La Chapelle, but only a few seconds remain in the film. Your film is the one that highlights the collection the most, almost in a “fetishist” manner, as is you were doing the work of costume designer and wanted to create characters. What is the importance of clothes in your work ? In my films, where I often have to take care of the costumes myself, the clothes are thought extensively but it remains invisible. They participate in the embodiment of the characters, it’s an extension of the writing. I often get inspiration from the actors’ clothes to start, to which I mix other missing pieces. 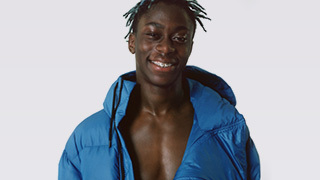 For Olympus, I proceeded the same way, collaborating with Georgia Pendlebury and mixing KENZO’s pieces with the youth’s clothes. 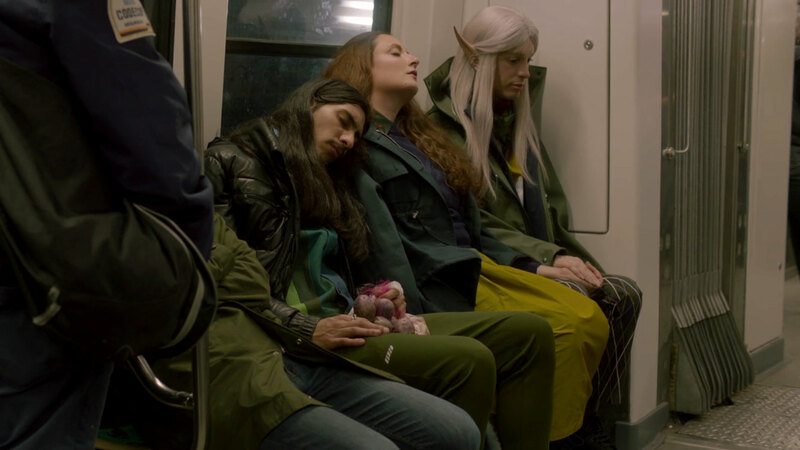 An elf falls asleep in the metro of Buenos Aires. What does he dream of? Maybe of being a young Bolivian man, a robot constructor, evolving in a city that seems to have been built by a child with a wild imagination. 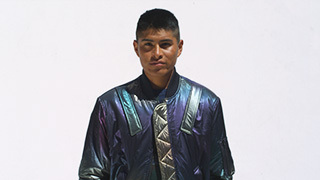 In his film, Eduardo Williams continues his project of connecting disjointed terrestrial. From Buenos Aires to La Paz, we move from cool to warm colors, from a fruit and vegetable shop to a dark cave where big metal figures are fabricated. Or maybe something else is being made there. Indeed, it is far away in the phantasmagoric woods of Fontainebleau that those metallic experimentations come to life as agile as voguing dancers. In a few minutes, we travel through three countries, two continents and through the bodies it captures, the voices and sounds it registers, it is the entire world manifesting at our senses. How did you approach the theme “Inhabit the Earth”? I thought it was a theme that connects easily with what my films talk about normally. So I just thought about what I would like to share in the format and the different restrictions and possibilities of the project. I like to think about living together in different places of the planet and share diversity of points of view through the language of cinema. In your film, the landscapes feel unfamiliar as if they belonged in another dimension. Your characters are strange as well, looking like aliens. Did you want to experiment with genre with this film? I don’t think much about categories such as genres or other ways to catalog cinema. I’m interested in the relation between the sensation of reality and fantasy, the normal and the unfamiliar. I think that everyday places and situations can be shown in a way by which this sensation of reality can be questioned. I think the characters have their own particularities, each one is special in a different way. I think that more than aliens we can see they have different interests and ways of living. How did the collection influence your choice of places and colors for the film? It’s as if the places were an extension of the clothes. I think this was quite intuitive. I saw all the collection and then thought about different ideas for the video, without making a specific logical connection between them. I had different options for the clothes and decided some things when I was in the real places where I was going to shoot. It was important for me to feel the connection between the persons and the places in the video, to see them as a whole and not see the people as separate from their environment. Clothes maybe could help to do this in some way. Where did you shoot your film? How are these places important to you? They are all places that I find attractive visually and in some cases because of their sounds also. 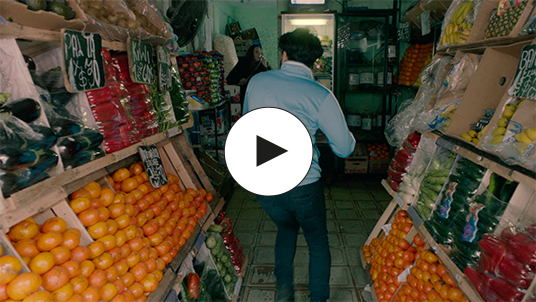 We shot in Buenos Aires, in a vegetable shop and in the subway. These were two places that were part of my everyday life. I think the shop is very interesting in its forms, the colours and the way fruits and vegetables are exposed. I think there is an interesting relation between natural and artificial and an everyday space which is also quite strange. It was also an interesting place for someone that wants to be an Elf to be working in, doing a job that’s not related apparently to that. The subway is also an everyday place that it’s very particular at the same time, with its speed and sound. I also like public transport because it’s a place where many different people meet. It connected in an interesting way with the cableway in La Paz, Bolivia, which is used in the same way but it moves many meters over the surface. I also wanted to look at the particular form of the city of La Paz, where I had been last year and was very impressed by its shapes and colours. I also wanted to shoot in El Alto, a city beside La Paz where there’s a very special type of architecture that is inspired originally in Aymara culture and also takes other influences such as Transformers as I could discover later. We shot with Esteban Quispe, whom I discovered on the internet and I admire, he makes robots with elements he recovers from trash. So we shot in his working place in Patacamaya as if it was inside the ‘robotic’ house in El Alto. I wanted to use his work at creating robots as a possible connection with other people, far away in Fontainebleau’s forest. This landscape is quite strange for me. I liked its lack of colour in relation to the colours of the clothes and its somehow abstract shapes in relation to the moves and attitude of the characters. I wanted to connect the images of creating something with metal and sparks to a natural place with people using it in a special way. I discovered Luis Padrón and Esteban Quispe on the internet. They are very different and both attracted me for different reasons. I liked how Luis wanting to be an Elf says he tries to look unreal, putting in evidence how image relates to sensation of reality for many people. Esteban’s work is really admirable for me. How he loves to work creating different types of robots and he gets to do it with intelligence and the sense of overpassing obstacles. In the last part I worked with voguing dancers. I went to several voguing balls in Paris and admired very much the energy, talent, strength and place in society of the participating dancers. It was the first time I encountered this type of energy in Paris. I wanted to have in the video their energy and all that they say through movement. Is directing a film for a brand something different or challenging to you ? How would you say this film fit into the cinematic universe you are building through your work? It’s mainly different because I think that in this case the ideas would be connected to the intention of selling clothes when the people would see the video, and that doesn’t happen when I do films that are not attached to a company that sells other products. Some ideas I had I think that didn’t adapt well to this issue. Other than that I just thought freely about what I would like to see in a video like this if I was a spectator, and also what could I share that interests me and I believe it’s valuable. Restrictions of duration for the video and of time to produce changed some ways of working, this was a challenge. I advanced through it as a challenge not being sure if it would finally represent part of my work or not. Now I’ve finished I feel it shares part of my ideas and relation to point of view, landscapes, people, connections, diversity and some other things. Somewhere in a studio in Paris. The vertical format chosen by French director Baptist Penneticobra gives his film a pictorial allure. In the center, a black and modern Mona Lisa, delightfully rude and poetic, waxes poetics about orange juice. Soon she’s joined by a young man who imagines himself as the embodiment of an orange juice brand. Monomania is shared and expresses itself in absurd monologues hard to identify: is it rap or spoken word, or is it the way these young people usually express themselves? It doesn’t matter. Intonations, inflections and rhythms fascinate and hypnotize. We never leave the dark place where our heroes are sitting, but we get lost rapidly, disoriented by the detail-rich descriptions in the monologues from which emerge stereotypical Americana landscapes. Your proposition is rather surprising, how did you interpret the theme “Inhabit the Earth”? I wanted to talk about something trivial —like the orange juice from McDonald’s —and pull the thread as far as I could until it becomes almost abstract. It seemed to line up with the theme “Inhabit The Earth” which touches on something universal. Cheap orange juice is pretty much the same everywhere. I liked the idea of going from something small to talking about something larger, and at the same time verging on something more and more obscur, theoritical, until it becomes almost stupid and random. You have directed short films, music videos, a TV series and now a film for a fashion brand. Do you approach these different forms the same way ? I think I try not to put everything on the same level. What is true, though, is that music generally occupies a crucial place in my films, and inversely, I try to think of music videos as fictions that can stand on their own. For this film it was something else. Three minutes is a specific format, not too short but not too long either, it had the benefit to allow something more immediate, to imagine a purer form that goes right to the point : 3 shots, 2 characters, 1 long zoom. This film is a bit similar to a music video you directed, Nobody — here again we can find a reference to orange juice. Is there a filiation between this new short and the rest of your work? The monologue is probably the recurring pattern; the night, the banal, a certain flow in speech. For this film I tried to stretch the writing as far as I could by letting myself being carried on by the sounds and rhythms produced by the text rather than by a true fictional reasoning. I felt like I was writing verses for a rap track more than a film, it’s a change of logic I have started being aware of from For Real, tho, and then when writing on Nobody. My previous films were written and rewritten after finding the protagonists during the casting phase— which was also the case for this one —drawing inspiration from them to produce their discourse, all the while directing the ensemble towards what I wanted to talk about. How did the collection influence the film? I spontaneously chose the simplest pieces in the collection. I wanted to avoid the fashion aspect that sometimes gives the feeling that clothes were put on characters that didn’t ask for it. I wanted the film to be set in a garden or under a porch, eventually near a swimming pool, with worn-out plastic chairs, a place where people spend their time talking through the night, in the suburbs, something a bit trivial that would be in at odds with a fashion collection. I needed the characters to be in coherence with their milieu more than the clothes being coherent with the characters. How did you choose the actors ? It’s always a long process because I’d rather work with non-professional actors that I find via Craigslist and other small ads. For this one, we met a lot of people in Paris, but the auditions were disappointing, excepted Jack Robinson’s who’s from New Castle et who had never auditioned or played in the film but who had this non-acting style that I found interesting. A few weeks before starting pre-production, I was in Michigan in an artist residency. That’s where I met Karmesha Clark who is from Detroit and who I found astounding. We decided to have her come to Paris and to make her the main character of the film. The shots are really close to the actors, it’s dark. Everything comes down to the performances, the accents and the references. It could happen anywhere as if to you a place wasn’t necessarily linked to a physical space or environnement. I’m always intrigued by non-places, those territories and ordinary structures that everyone can identify : parking lots, stadiums, roads. They have a double interest : they are evocative in the sense that a few signals are enough for them to exist (a bit of fences, a foam cup) and at the same time function like neutral spaces in which characters can exist and speak to the audience. It’s true that with this film, in this vertical format, the setting is even more reduced to a web of signs, quasi primitive, and that’s exactly what interests me.